According to one study, in the AEC industry, the average bid hit rate falls in between 37 and 44 percent. Another study showed that the average bid hit rate is between 10 and 50 percent depending on the type of project and firm. Whichever study you look at, given the difficulty of winning bids in this competitive process, it’s clear that putting together world-class bid packages in a custom, branded binder that promotes your company and demonstrates professionalism is critical to success. How can you put together a custom bid package that communicates value and wins more bids for your business? In many cases, your bid package may be the only thing your potential client sees. That makes it especially important to exude professionalism in every way possible, from your creatively branded binder to the actual nuts and bolts of your bid. Organize your bid package in a custom binder to demonstrate, right up front, that you’re serious and driven to complete the job. With custom dividers, you can turn what would usually be a mess of paper into a well-structured, easy-to-consume bid package. Dividers allow your customers to easily flip through and find the sections that are most important to them. You can use these dividers to create sections for your company history as well as your value proposition. Tell them everything they need to know so they understand that if they chose you, they’ll be working with the best. Once your custom bid package has explained your company’s value proposition to your prospective client, it’s time for examples. Create a new section in the binder with examples of projects you’ve worked on in the past. If possible, include testimonials from previous, satisfied customers. If you work on a variety of projects, make sure the examples of the work that you show demonstrate your expertise on the type of project you’re bidding on. Even an impressive project is not going to help you much if the prospect doesn’t think your company has relevant experience. Putting a face to your name humanizes your company and your bid. So add a section in your custom bid package that shows the customer the specific team members who will be working on the project. Give a short summary of their specialties, why they work at the company, and what value they bring to the client’s projects. In this way, your bid package isn’t just a number but instead a team of professional individuals that your prospect can trust. After demonstrating the appeal of your company, your team, and your collective experience, the only thing that’s left is the bid itself. Use dividers in your custom binder to separate off any financial information that you need so the prospect can quickly understand your bid. Along with the bid itself, include a closing statement that demonstrates why your company is the best choice. You can take some creative license with this final statement but make sure it explains what makes your company different and why your team is the best choice for the job at hand. It’s largely up to you to think through the best way to describe your company to your prospects in the bidding process. But organizing your bid into a custom binder with well-placed dividers is a no-brainer. 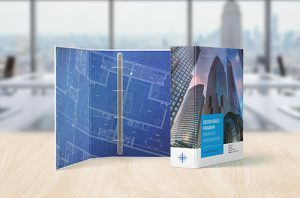 Make sure your next bid package stands out with a binder designed to your exact specifications.